This is a definite graphic I did myself. This is named New Moon Wolf. During the New Moon, the wolf calls out to be heard... can you hear the call of the wild ? "HAVE A BLESSED HAPPY EASTER WEEKEND BROTHER DAVID WHITE EAGLE"
rock and roll ; easy listening; like it all. Love pow wow and flute music, new age you name it. "Religion is for those who are afraid of hell, spirituality is for those who have been there. " Married. Have had 3 children one moved out, will be 22 this month. Two daughters both afflicted with a disease have crossed over. One was 4 and one 3 when they crossed. Married now going on 11 years and very happily too. Both of us are disabled and enjoy children , crafts, music, computer work, and much more. Blessings to all. 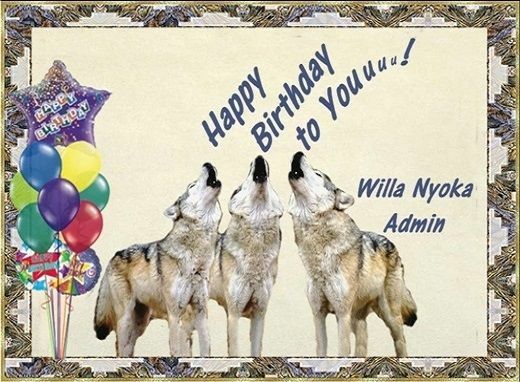 OSIYO WISHING YOU A BLESSED HAPPY BIRTHDAY BROTHER DAVID WHITE EAGLE.HAVE A SPECIAL DAY.MANY BLESSINGS TO YOU. I wanted to take a moment to thank all of you for your warm Birthday wishes, and thank you all for being yourselves. It is a pleasure and honor to be here with you all... my family. Thank you again. Some information for all, of course, entitled "Did You Know.."
1. On the MassHealth system used nationwide, if you are on disability, elderly or low income in general you may get on this system, and get poor coverage, but if illegally in the country you may apply for it, get it guaranteed and get up to 100% coverage. Makes sense huh ? I wanted to sincerely, and from the bottom of my heart thank you all for your kind words and gestures on my birthday. I love you all. Again thank you so much.